*KKamp does not endorse vandalism. Stick it on your own stuff! Proud Kombucha drinkers and brewers everywhere will thrill to share their "heart on their sleeve" with this simply designed easy to read declaration of love: I HEART Kombucha! Love this!!! I added to a magnet and have it on my fridge! Yay, so cute! I love Kombucha! Great sticker. 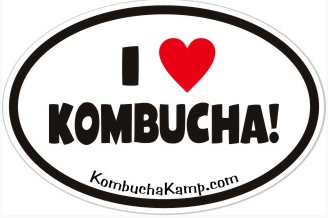 I do love Kombucha!